I intentionally did not eat any Chinese food in San Francisco up until this meal. The reason? I was meeting up with some relatives for dinner and I know my aunt and uncle usually end up eating Chinese food, so I was expecting it. We went to an ol' standby in Milpitas - Mayflower. To preface this visit, I am completely spoiled by the stellar Chinese food in Vancouver. For me to apply the same criteria and expectations here would be unfair. 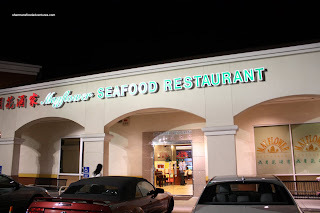 I've been to Mayflower countless times for Dim Sum and Dinner. The first few times were not really all that impressive. However, as the years went by, I noticed that it got better and better. Now that it is under a new ownership group, it appears that there has been even more improvement. I guess I'll just have to see if the proof is in the Mango Pudding (sorry for the lame joke). After an afternoon of eating, I really wasn't sure if I had an appetite at all for a complete Chinese meal. At least I could somewhat control the portions by taking less when the plate got to me on the Lazy Susan. What I didn't account for was that my uncle kept piling food on my plate. So generous of him, so bad for me! It's not very often I find eating a chore; but this time might qualify as one. Prior to our first dish, I noticed that there were both candied walnuts and XO sauce on the table. Normally, not all patrons receive these items. My uncle frequents the restaurant often and I'm sure they take care of him. I remember the first time I dined at Mayflower, it was in the 90's and the XO sauce merely consisted of chili oil, garlic and a few dried shrimp. Now, it's a mound of dried shrimp, dried scallops, garlic, chilis with very little oil. Pretty darn good. I still prefer the XO sauce at Victoria Restaurant in Vancouver; but this one has come a long way. 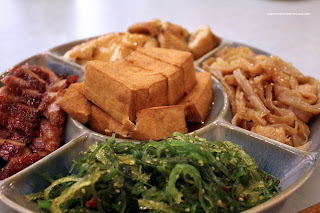 We started off with an Appetizer Platter which consisted of Jellyfish, BBQ Pork, Marinated Seaweed, Soy Chicken and Fried Smooth Tofu. Pretty standard dish and everything did their part and not much to gripe about. Next was the large clams with scallops. Presented impressively in a large half-shell, the clam pieces were perfectly cooked. The same could not be said about the scallops. They were a bit overcooked. 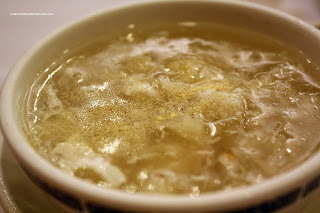 Next up was the Fish Maw Soup with Crab Meat. This should have been called a stew instead because there was more ingredients than broth. Packed with fish maw and large crab pieces, this soup was pretty good. The broth was a bit one dimensional in flavour; but at least it wasn't salty. Furthermore, I liked the consistency of the broth, it was just the right thickness. When the Peking Duck arrived, I was a little perplexed. In place of the standard steamed flour crepes, we got steamed mini-buns instead. Honestly, that made for an awkward wrap. 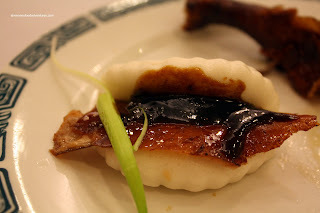 There is just not enough surface area to put the piece of duck skin, scallion and hoisin sauce. Other than that, the duck skin itself was a beautiful roasted colour glistening with duck fat. It's not very often you see the rest of the duck beneath the skin on the same plate. I know that in China, they do serve it this way; however, it is not common in a Cantonese restaurant. Usually, the duck meat is used for lettuce wrap or soup. Whatever the case, the meat was delicious and not over seasoned. 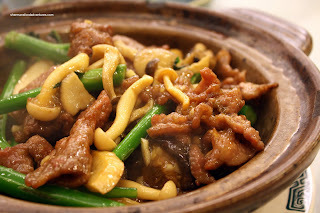 The Beef with Mushrooms and Green Bean Hot Pot arrived next. Sizzling hot, the tender beef slices were a bit on the salty side. However, combined with the mushrooms, there was a good combination of flavours. The beans were bright and still crunchy. 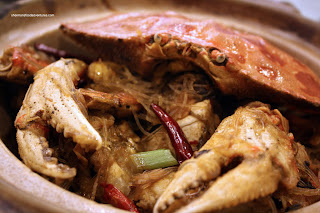 Continuing with hot pots, the Crab and Vermicelli Hot Pot arrived. To tell you the truth, I had to rearrange the crab for the picture. Otherwise, all you would've seen is the top of the crab shell. The flavours in this dish were quite concentrated due to the lack of liquid. Thus, the vermicelli was a bit stringy. I actually don't mind this texture, I prefer it. However, it was a bit difficult to take a chopstick full without needing scissors. The crab was fried perfectly exhibiting freshness and elasticity in the meat. By this time, I was quite full. I wasn't exactly thrilled to see the really big plate of Peking Pork Chops. Trust me, normally I would be quite happy; but I don't think I could eat more than one piece. The dish was pretty good. 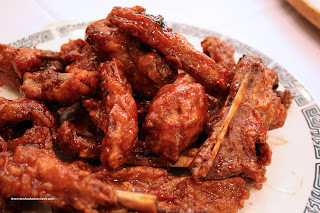 With just enough tangy sauce coating each tender piece of pork chop, the dish delivered. The only thing I wished for was a bit more robust flavour from the sauce (maybe more Worcestershire?). 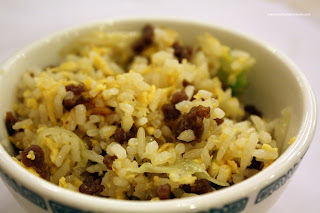 I'm usually pretty indifferent about Beef Fried Rice. After all, it's rice with beef, not the most exciting dish. However, this one was not bad. First, there was more beef than rice. Second, the rice was a bit chewy. Third, it was not too salty. I liked eating it. Choy. I'm not entirely sure if this was meant to be served in consume or not. I've seen some vegetables prepared that way. Whatever the case, there was way too much liquid in this dish. 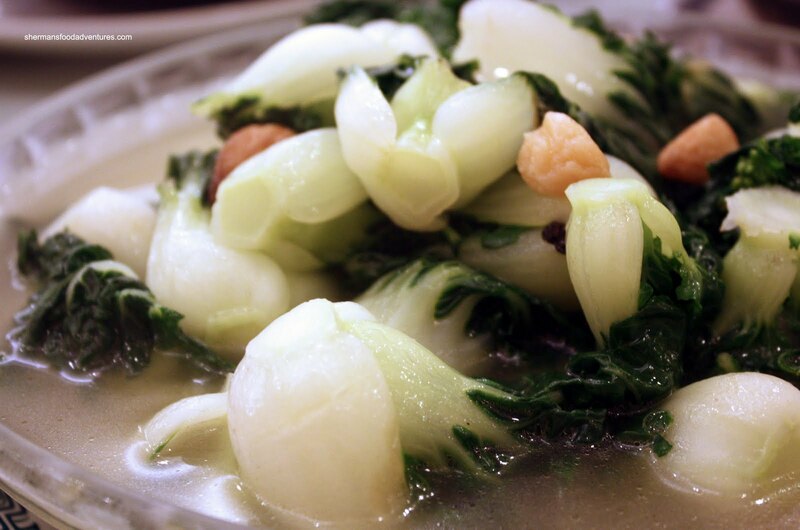 It essentially stripped the flavour from the bak choy. Also, it resulted in a slightly overcooked product. 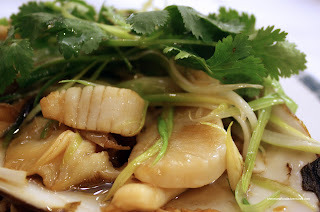 Another surprising dish was the Fried Whole Fish with Tofu and Bean Curd Stick. If you look at the ingredients of this dish, it resembles a Fish & Tofu Hot Pot. In this case, it was a fried whole fish with tofu with essentially the same oyster-based sauce. Normally, Chinese people would shun deep frying a whole fish, especially when there is a sweet and sour sauce over it. However, this one worked. The fish was cooked nicely and the use of salt was conservative. It reminds me of a dish from Victoria Restaurant in Vancouver which is essentially the same thing; but uses certain parts of a Sturgeon. After all this, several desserts arrived and I only had my eyes on the "Turtle Jelly". Yes, you heard me right. However, I'm pretty sure this is not the real thing because it's usually quite expensive. My uncle said it was probably a powdered mix, which I'm pretty sure he's right. This is generally quite bitter and herbal. You need to like it to eat it. 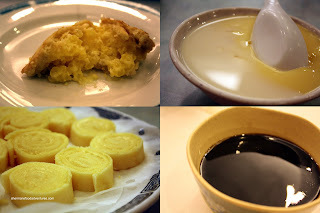 Other desserts included Mango Pudding and Baked Tapioca Pudding, Sponge and Sponge Cake Rolls. You know what? Since the first time I ever visited the Mayflower, it has improved. Although I still prefer Vancouver Chinese food, this was not that far off. Too bad I didn't get to try the Dim Sum out this time around; but I'm sure (in the words of Gov. Schwarzenegger) I'll be back. Can't help but to ask this: Did your uncle find it akward you were taking pictures and/or re-arranging the food? Or the staff for that matter?? Well, I explained what I was going to do first, so everyone was okay with it. Not sure what the staff thought! You know what? Same as you, the Latino staff do know how to pronounce the items and... they understand requests in Cantonese. Impressive. Thanks Gigi! LOL... It's funny that the only people I see eating it all the time are non-Chinese. For me at least, frying a whole fish and covering it with sweet n sour is a good way to mask unfresh fish.